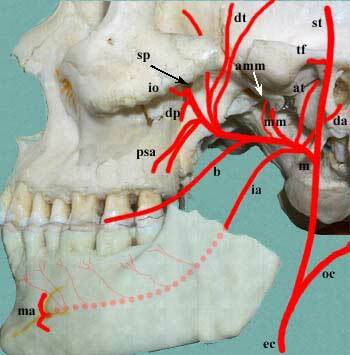 The external carotid artery arises from the common carotid artery and supplies structures in the face and neck. The external carotid artery is a major artery of the head and neck. It arises from the common carotid artery when it splits into the external and internal carotid artery. It supplies blood to the face and neck. The external carotid artery begins at the upper border of thyroid cartilage, and curves, passing forward and upward, and then inclining backward to the space behind the neck of the mandible, where it divides into the superficial temporal and maxillary artery within the parotid gland. It rapidly diminishes in size as it travels up the neck, owing to the number and large size of its branches. At its origin, this artery is closer to the skin and more medial than the internal carotid, and is situated within the carotid triangle. In children, the external carotid artery is somewhat smaller than the internal carotid; but in the adult, the two vessels are of nearly equal size. Several mnemonics are commonly used to remember the main branches of the external carotid artery. Mnemonic — Some Anatomists Like Freaking Out Poor Medical Students . Mnemonic — Sister Lucy's Face Often Powdered Attracts Medical Students . ↑ "Carotid artery". WebMD. Retrieved 28 July 2015. Wikimedia Commons has media related to External carotid artery.